Happy Monday Everyone! I still have some cards that I was not able to showcase during the release week. 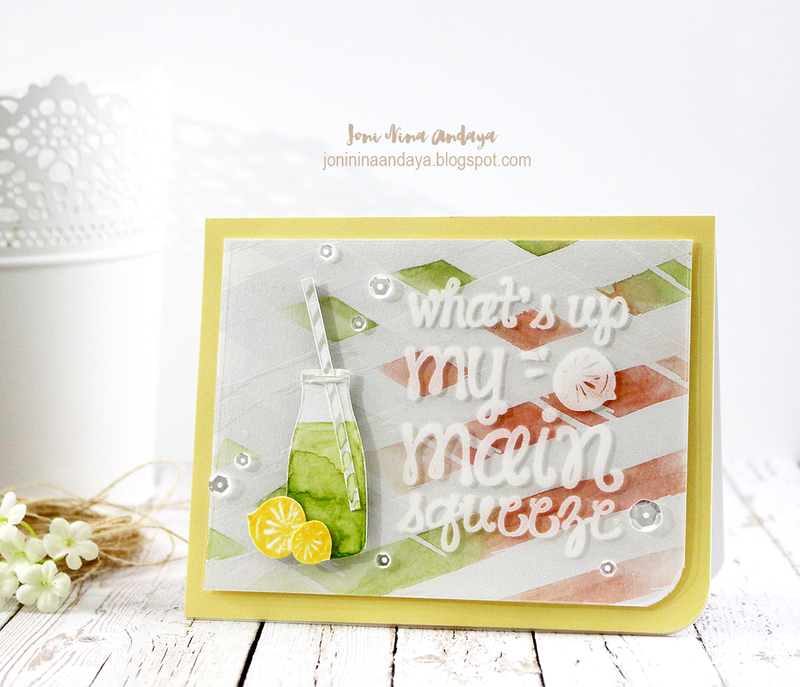 For today's projects its all about Main Squeeze stamp set. To begin I white heat embossed the watercolor panel with the large brush stroke image from the new Wplus9 Main Squeeze and watercolored it to make it sorta look like a plaid on the background. Next, I cut an old acetate, same size as the watercolored panel and stamped the sentiment using a Stazon white ink pad to make it permanent on the acetate. Next, I adhered the fussy cut watercolored milk bottle and straw from the Milk & Cookies stamp set. I also I added the lemon image from the Main Squeeze as well and fussy cut. To finish off I added some Pretty Pink Posh sequins in Sparkling Clear. For my next card very easy to multiply. I stamped the large brush stroke image from Main Squeeze stamp set on the panel to create a frame from it. Then, die-cut the center to create a window using the Love Showers Layers dies (rectangle). 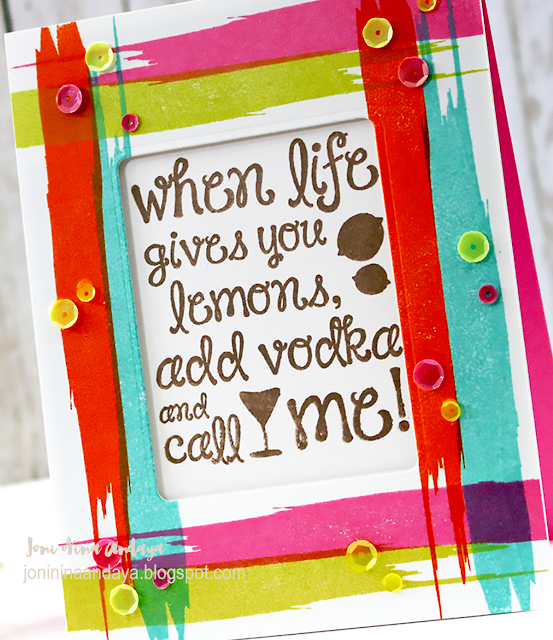 Next, I stamped the sentiment on the card base using the window panel as a guide. 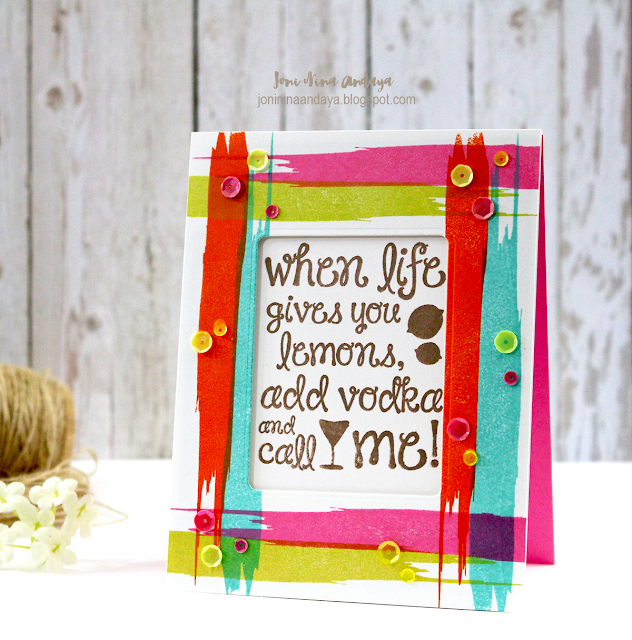 Then, added some Pretty Pink Posh sequins lemon drop and watermelon to finish off the card. Love that you used the acetate overlay on your first card Joni, so pretty! The second is fun, love the happy colors! I like what you did with the brush stroke stamp to create the frame on your second card that was really neat. JONI!!! Oh these are fantastic! Love that plaid you've created! I haven't given that brush-stroke stamp a second thought until this very minute!!! Too cool! These are just WOW GORGEOUS!! LOVING the colors!!! WOW!!!!! Love the acetate overlay, the bright colors! Gorgeous Joni! LOVE the bright one! These are both fabulous, Joni! These are so bright and colorful and just plain FUN! Really love what you did with the brushstroke stamps. Such a clever and creative framework. 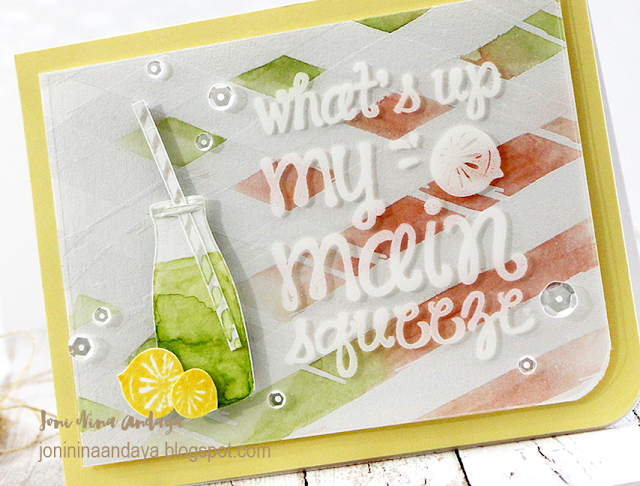 And that little watercolored milk bottle and lemons are SO adorable! I love them both Joni, thank You!! Pretty Pink Posh June - Watercolor Blog Hop!